Compliance Edge is a custom knife shop located behind enemy lines in San Jose, CA. 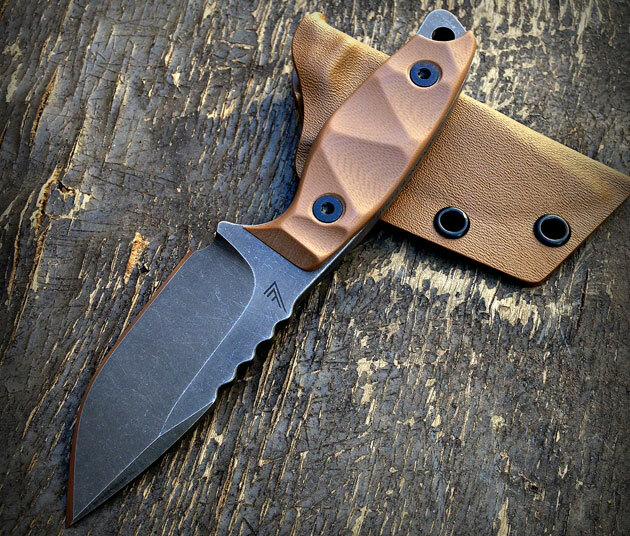 I discovered Compliance Edge on Instagram a year or so ago, and have been following one Compliance Edge design in particular: a small fixed blade called the Vendetta. 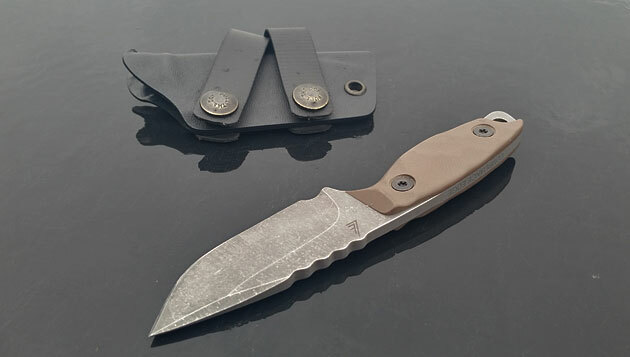 The Vendetta is a custom knife that I categorize much like the custom Coye ForeRunner. It’s an EDC utility knife that hits the sweet spot in what I’m looking for in an everyday carry knife – big enough to use, small enough to conceal. As of today, the Vendetta is offered in two different base configurations: the standard Vendetta, and the Vendetta S, the only difference between the two being blade thickness. The standard Vendetta uses 1/4″ S35VN, whereas the Vendetta S uses a thinner 5/32″ S35VN. I opted for the thinner S version, as I feel it’s a better choice for an EDC style blade. Compliance Edge uses S35VN for the Vendetta with a hardness of 59 HRC. If you’re not familiar with S35VN, it’s essentially a tougher version of S30V, and an overall excellent steel, especially for an EDC knife. Often called a “stainless” steel because of its corrosion resistance, S35VN has good wear resistance and strength, and excellent edge retention. S35VN also seems to be a bit easier to sharpen over S30V in my testing. As mentioned, I opted for the S version of the Vendetta, and have been very pleased with that choice. The high flat grind along with the 5/32″ thickness makes my Vendetta S a great slicer, and best of all, it’s incredibly lightweight, weighing in at just 3 ounces. The Vendetta has jimping along the spine, but it’s a little different than most jimping in that the ridges are more rounded and spaced slightly farther apart. Nevertheless, the jimping feels good and does the job. 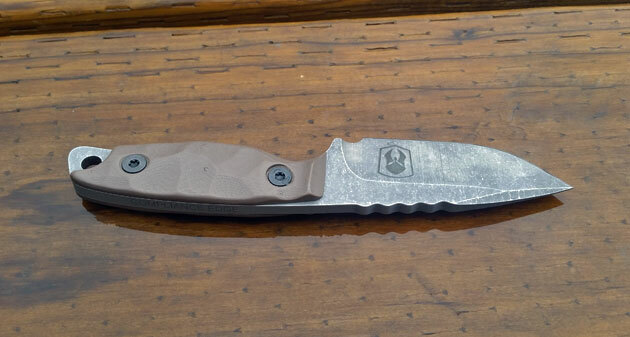 The blade finish on my Vendetta is acid stonewash, and I think it looks fantastic. 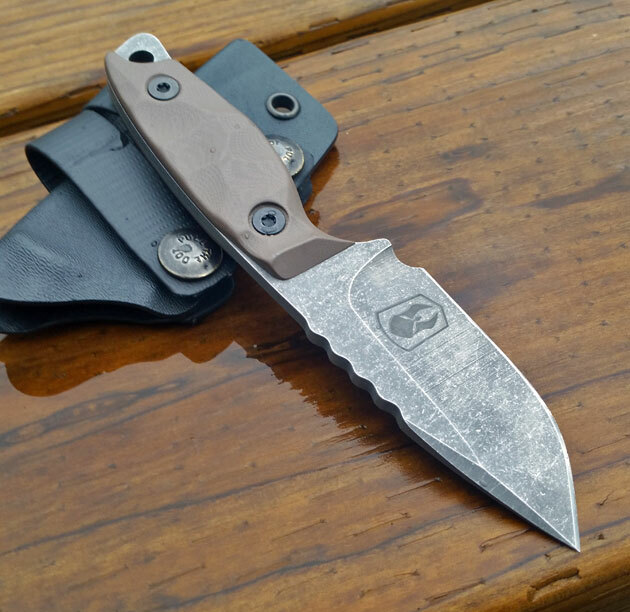 But if that acid stonewash isn’t your thing, you’re in luck because Compliance Edge has many options to choose from, including a custom Cerakote color option. The Vendetta has excellent ergonomics and feels great in hand. Even though it’s a small knife, I can still fit all four fingers on the handle, and I don’t have small hands. My Vendetta has a random G10 handle pattern, but if that doesn’t work for you, Compliance Edge again gives you several options to choose from. The handle ends with a lanyard hole for those of you who like to accessorize. 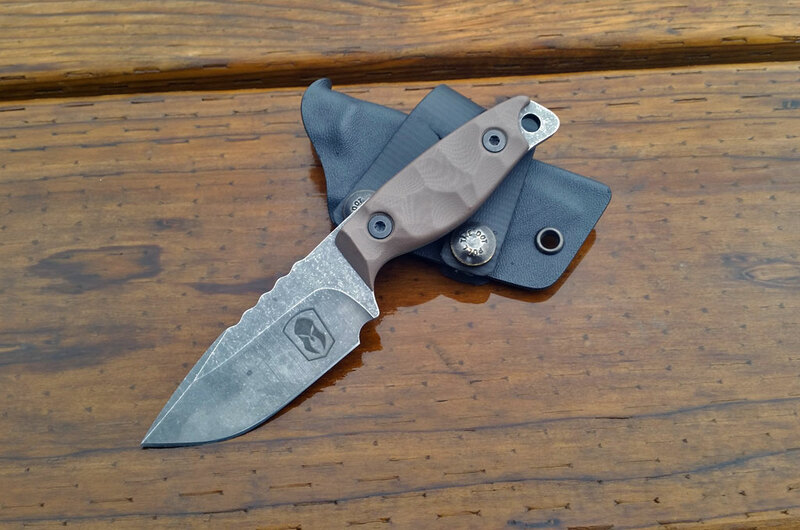 The Vendetta comes with a custom Kydex sheath that has good fit and attention to detail. Best of all, you get to choose the Kydex color, as well as your fastener/belt attachment. I opted for soft loops, which allows me to carry my Vendetta horizontally on my belt, my preferred method for carrying small fixed blades. However, if you like to carry a different way, Compliance Edge gives you several options to choose from, including the popular Blade-Tech Tek-Lok. You might have noticed a theme, and that’s options. Compliance Edge allows you to customize nearly every aspect of the Vendetta build process, right down to offering custom etching on the blade. I thought about trying to list all of the options available, but there literally are too many, and Compliance Edge seemingly adds more all the time. Check out the Vendetta and Vendetta S pages on the Compliance Edge website for an updated list of all available options. The Compliance Edge Vendetta is a great little fixed blade, but the best feature of the Vendetta might actually be the price. I don’t usually like to list pricing on custom knives because the price of things made by hand seems to change more often than things made by machine, but for the Vendetta I’ll make an exception. At the time of writing you can purchase a custom Vendetta or Vendetta S for $230. If you know custom knives, that price is a steal. If you’re looking for a small fixed blade knife for EDC, you should definitely take a look at the Vendetta and the Vendetta S. I think you’ll be glad you did. Why Do You Need a Gun to Go Shopping? I have a Vendetta and a Taipan XL from Compliance Edge and I am very happy with both of them. Top notch work from Yoni! Wow, beautiful knife. I think I have to have one. This review is awesome! Can you do a review on two or three other knives. The first one is the Dead Moose Ops- Breacher (beautiful blade). The other two are made by Forsaken Blade Works, and those two are the Undertow and C3 Field Knife; both look pretty damn cool. I’m looking to by my brother a nice knife for his Molle vest while he’s on deployment. Both excellent, but you can’t order a ForeRunner b/c the books are closed. Yes, I just noticed Coye’s books are closed! Dang it. He listed 6 on Instagram the other day, but by the time I saw his post they were all sold! Join his mailing list, and the wait lists at his dealers. Would you happen to have a pic with the Forerunner and Vendetta together? If I order a Vendetta, I’m going to have a hard time visualizing the difference between the regular Vendetta and the Vendetta S. Thoughts between the two blade thicknesses? I prefer the Vendetta S over the Vendetta. No I don’t have a side by side shot of the two, but they are nearly identical in overall length. Also, do you plan on ordering any future special runs of Moderno Forurunners or Vendettas? Click the link in the review and order one.